Much of the lesson can be done on the computer, but some can be printed out for reading offline. Familiarity is needed with Google Earth and should already be available on student computers for in-class lessons or assigned to take home. Students may need help in plotting graphical information in Excel. A good introduction to the Arctic and the differences between it and lower latitudes: light, vegetation, climate. Also good for working with weather and climate as activity has students gathering local information on soil temperature, albedo, and humidity. 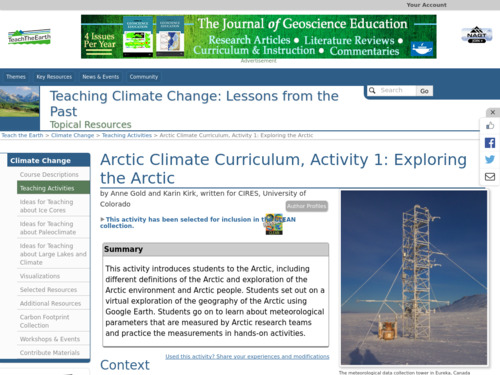 Comments from expert scientist: Comprehensive Arctic Climate educational tool with extensive material, activities (with numerous extensions), data and ideas. My only criticism is that it is so ambitious and comprehensive that it takes a little while to get situated and figure out exactly what this material encompasses. Students are introduced to the Arctic through vegetation data, native population information, and Arctic research stations (IASOA). They explore the station sites through Google Earth and then gather local data on their own of albedo, relative humidity, and soil temperature. Students can then consider what their data tells them about where they live and how it might be different or important to study in the Arctic. Uses a series of multimedia resources as well as science data that students both collect and analyze. There are two more Arctic Climate Activities that can be used in combination with this resource. Teacher notes are clear with instructions and student handouts, along with links to articles and information that can be read online or possibly printed out for classroom use. Instructions for using Google Earth are included. Complete answer key is available to teachers per email request.